After recently celebrating 11 years on stage, there's a reason why Stephen Schwartz's musical Wicked remains as one of the West End long-runners. A dazzling, glittering affair, it waves the flag as one of the traditional, big-belter Broadway musicals, featuring a mesmerising score that has been sung in bedrooms and at karaokes across the country. Billed as “the untold story of the Witches of Oz”, Wicked is the now well-known story of how the Wicked Witch of the West and Glinda the Good came to be. It's the ultimate story of friendship, and years after first opening in 2006, Wicked continues to be one of London's best shows. 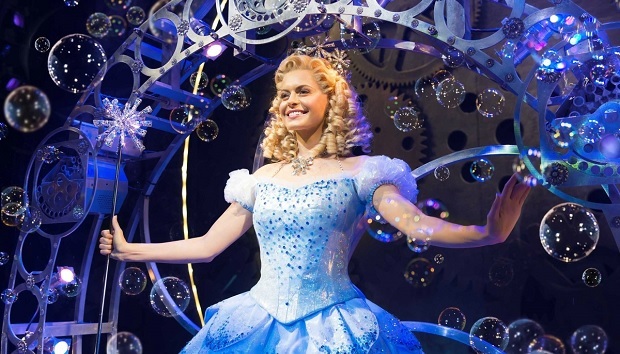 Undergoing a recent cast change, the production sees previous standby Alice Fearn take on the green Queen, alongside BBC's Over the Rainbow contestant Sophie Evans as Glinda. It's a dreamy pairing; both have exceptional comic timing and powerhouse vocals, as well as a noticeable bond which is particularly prevalent in “For Good”. Fearn's rendition of “No Good Deed” sees her stamp her own vocal arrangement on a well-known track, bringing the house down. Bradley Jaden's Fiyero is less of a thrilling casting choice. Despite his dashing good looks, the Winky Prince's vocals are, at times, too harsh and overpowering, although his chemistry with Fearn is undeniable, particularly in the darkly romantic “As Long As You're Mine”. It's interesting to see that after so many years, Eugene Lee's design and Susan Hilferty's costume avoids looking dated, and is still just as breath-taking as before. The detail is unbelievably good, from Glinda's many glittering dresses, to the emerald green city of Oz. As a spectacle, you cannot fault it, and it helps that after being at home in the Apollo Victoria for so long, the whole theatre is decked out in green. Wicked is a rarity in that it's one of the few musicals that will genuinely appeal to all ages. Showcasing two of the best leads that the show has seen in years, it's a wonderfully thrilling spectacle with a strong message of friendship that is bound to resonate across audiences. With an unbeatable score, jaw-dropping vocals and an always electric atmosphere, thanks to the returning Wicked superfans, this is a musical that is guaranteed to stick around for good.